The type of aerial needed depends on the site requirements, so we normally recommend a site survey to identify the optimum type. Factors that influence the requirements include the radio frequency, the range required, whether or not directional aerials can be used and any environmental needs. Note that a site survey will also test the radio path to confirm that the system would work, and identify which radio channels are already in use, to ensure that the system will not interfere with any existing users and they will not interfere with it. A dipole aerial transmits equally in all directions (including up and down), and is used as the reference against which aerial gain is measured. The radiation pattern can be visualised as a sphere. Colinear aerials and some whips give a radiation pattern like a doughnut, so offer a higher gain in the horizontal plane but don’t transmit up or down. Yagi aerials are directional and give a radiation pattern like a funnel so focus the power in one direction. It should be apparent that a base-station that communicates with a number of outstations usually needs to use a dipole, colinear or whip aerial. Each outstation only needs to transmit to the base-station, so can use any type of aerial. 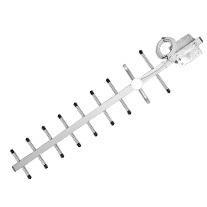 This aerial is 65mm long and is a universal GPRS aerial that can be used with any network provider. It can also be used with 868MHz radios, but it is not weatherproof so should not be used outdoors. This aerial is 340mm long and is an effective omni-directional aerial for use with 458MHz licence-free radios. It is typically fitted to the top of an enclosure (connected to the telemetry module via a bulkhead extension cable) but since it is weatherproof it can also be used on a mast by using the 7360 Aerial Extension Lead. This aerial is 200mm long and is an effective omni-directional aerial for use with 868MHz licence-free radios. This is a very rugged unity-gain aerial that drops into the top of a 2” pole with the cable coming down the centre. This is similar to the ENF450 but attaches to the side of the mast, so can be used when there is another aerial in the top. This gives 9dB gain in one direction at the expense of much lower gain in all other directions. * Licence-free regulations define the maximum effective radiated power (ERP) in any given direction. When using an aerial with gain the transmitter power output must be reduced accordingly. The benefit given by the aerial is therefore restricted to only improving the receiver sensitivity.